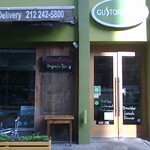 According to their website, GustOrganics is the first USDA certified organic restaurant in New York, and the nation’s first restaurant to use 100% USDA certified organic ingredients, including its meats. It's even got an organic bar! With a Mediterranean flavor to their menu and many gluten-free options, the restaurant's green vision includes corn straws and low-energy appliances. 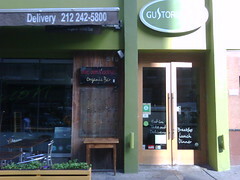 Owned by an Argentinean New Yorker, GustOrganics has a local preference for the produce they buy, their investors and other partners.